A research group at KAIST presented a novel biosensor that can produce diverse, high-level microbial cell factories. The biosensor monitors the concentration of products and even intermediates when new strains are being developed. This strategy provides a new platform for manufacturing diverse natural products from renewable resources. The team created four natural products of high-level pharmaceutical importance with this strategy. Malonyl-CoA is a major building block for many value-added chemicals including diverse natural products with pharmaceutical importance. However, due to the low availability of malonyl-CoA in bacteria, many malonyl-CoA-derived natural products have been produced by chemical synthesis or extraction from natural resources that are harmful to the environment and are unsustainable. For the sustainable biological production of malonyl-CoA-derived natural products, increasing the intracellular malonyl-CoA pool is necessary. To this end, the development of a robust and efficient biosensor was required to monitor the concentration of intracellular malonyl-CoA abundance as new strains are developed. Metabolic engineering researchers at KAIST addressed this issue. 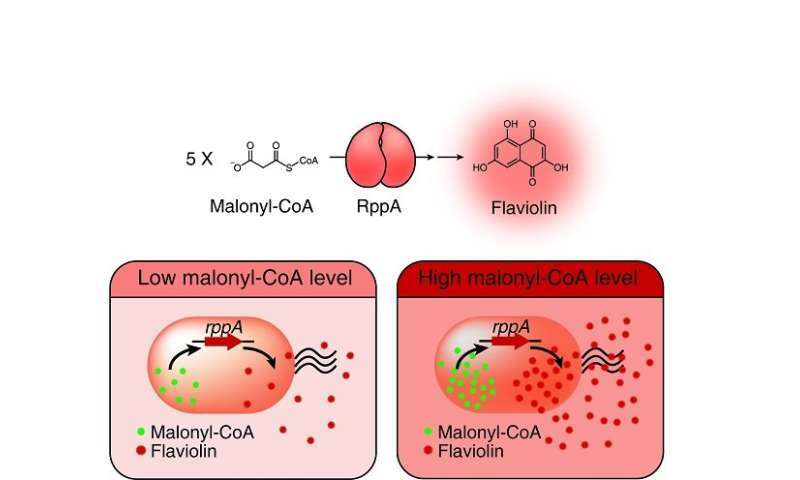 This research reports the development of a simple and robust malonyl-CoA biosensor by repurposing a type III polyketide synthase (also known as RppA), which produces flaviolin, a colorimetric indicator of malonyl-CoA. Subsequently, the RppA biosensor was used for the rapid and efficient colorimetric screening of gene manipulation targets enabling enhanced malonyl-CoA abundance. The screened beneficial gene targets were employed for the high-level production of four representative natural products derived from malonyl-CoA. Compared with the previous strategies, which were expensive and time-consuming, the new biosensor could be easily applied to industrially relevant bacteria including Escherichia coli, Pseudomonas putida, and Corynebacterium glutamicum to enable a one-step process. The study employs synthetic small regulatory RNA (sRNA) technology to rapidly and efficiently reduce endogenous target gene expression for improved malonyl-CoA production. The researchers constructed an E. coli genome-scale synthetic sRNA library targeting 1,858 genes covering all major metabolic genes in E. coli. This library was employed with the RppA biosensor to screen for gene targets which are believed to be beneficial for enhancing malonyl-CoA accumulation upon their expression knockdown. From this colorimetric screening, 14 gene targets were selected, all of which were successful at significantly increasing the production of four natural products (6-methylsalicylic acid, aloesone, resveratrol, and naringenin). Although specific examples are demonstrated in E. coli as a host, the researchers showed that the biosensor is also functional in P. putida and C. glutamicum, industrially important representative gram-negative and gram-positive bacteria, respectively. The malonyl-CoA biosensor developed in this research will serve as an efficient platform for the rapid development of strains capable of producing natural products crucial for the pharmaceutical, chemical, cosmetics, and food industries. An important aspect of this work is that the high-performance strains constructed in this research were developed rapidly and easily by utilizing the simple approach of colorimetric screening, without involving extensive metabolic engineering approaches. 6-Methylsalicylic acid (an antibiotic) could be produced to the highest titer reported for E. coli, and the microbial production of aloesone (a precursor of aloesin, an anti-inflammatory agent/whitening agent) was achieved for the first time. "A sustainable process for producing diverse natural products using renewable resources is of great interest. This study represents the development of a robust and efficient malonyl-CoA biosensor generally applicable to a wide range of industrially important bacteria. The capability of this biosensor for screening a large library was demonstrated to show that the rapid and efficient construction of high-performance strains is feasible. This research will be useful for further accelerating the development process of strains capable of producing valuable chemicals to industrially relevant levels," said Distinguished Professor Sang Yup Lee of the Department of Chemical and Biomolecular Engineering, who led the research.